I remember like it was yesterday. It was a cold, damp day (or was it warm and sunny?) in 1970 (or 71? ), well anyway, a brand new New York newspaper landed on the newsstands. What a surprise! 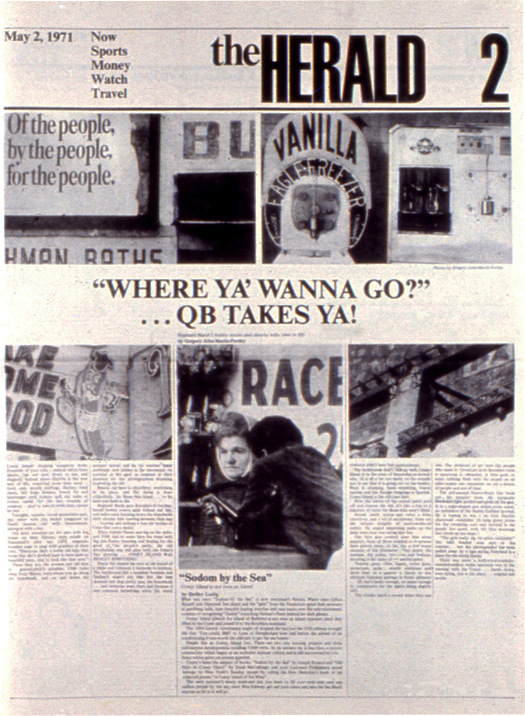 Compared to The Daily News, New York Post, The New York Times and The Village Voice it was a breath of fresh newsprint. All that unused white space, precisionist modular layout and limited use of typefaces and point sizes — The Herald designed by Massimo Vignelli was so beautiful I could cry. In a field marked by ham-fisted formats cobbled together in metal by crusty veteran “make-up editors” who possessed “news judgment” yet had little interest in the finer points of design, The Herald was a rare gem. 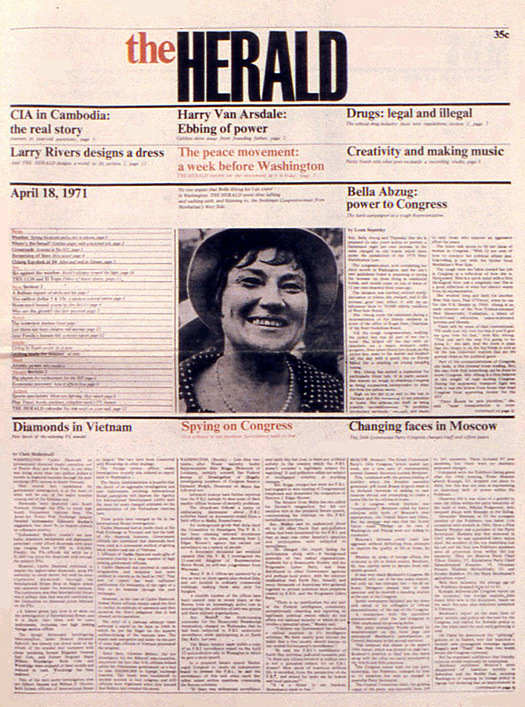 A few other jewels shined in the newspaper business prior to The Herald, including its namesake, the defunct New York Herald Tribune redesigned in the mid-sixties by Peter Palazzo. 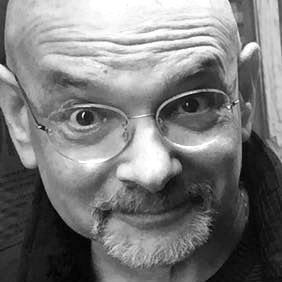 And at the Times, design director Louis Silverstein was feverishly redesigning the “grey lady” starting with the feature sections, although the news would remain locked in a 19th century tight eight-column format for almost a decade longer. The Herald, a weekly, was a clean, crisp and rational alternative. I worked as a designer in the New York underground press. To call these underground papers “alternative” suggested how naively unstructured they were. They were also sloppy (although exuberantly so). Most “layout” people were not and would never be designers. But I had aspirations to be a pro. The Herald was my model in this quest. But that’s enough about me. Vignelli welcomed the opportunity to try his hand at newspaper design. Many designers tried transforming the conventional daily, but so much stuff got in the way. Advertisements for one! Vignelli railed that “selling every bit of newspaper space to advertisers” was a principal failing. Partial page ads were blights around which dog-legs and other onerous wrap-around and layout contortions had to be accommodated. Modular layouts based on standard-size units were not yet accepted. So it was revolutionary (in a conservative kind of way) for Vignelli to institute a modular format. Of course, he was aided and abetted by not having to deal with ads — The Herald wasn’t accepting them in the beginning. In fact, Vignelli was adamant — advertising must be kept away from the editorial. “He started working on the layouts, testing [the proposition] that you could still do a newspaper without advertising, or [have] all the ads concentrated in some specifically designated pages,” says Beatriz Cifuentes, Vice President of Design at Vignelli Associates. 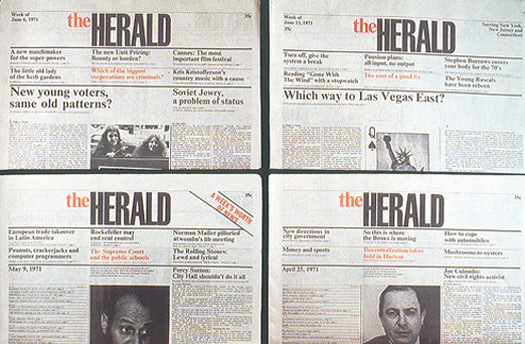 Vignelli said The Herald was “a very important experience for me, and it was followed with great attention by newspaper designers around the world.” Furthermore it led to designs for other newspapers he designed, including the European Journal, Skyline and IDCNY. As fate would have it, about a year after The Herald went to sleep with the fishes, the publisher contacted me about art directing a revived version, which he was thinking of renaming (though I don’t recall what). He also planned to retain in tabloid form aspects of the Vignelli format. I worked on one issue, trying to stick to the original look. Nonetheless, I couldn’t help myself; I busted the grid and introduced various headline type sizes and multiple quotes. All I can say in retrospect is, I could cry. Sorry Massimo. It's amazing how close this design is to modern web design. Fascinating and insightful article. Thank you for sharing your experience!